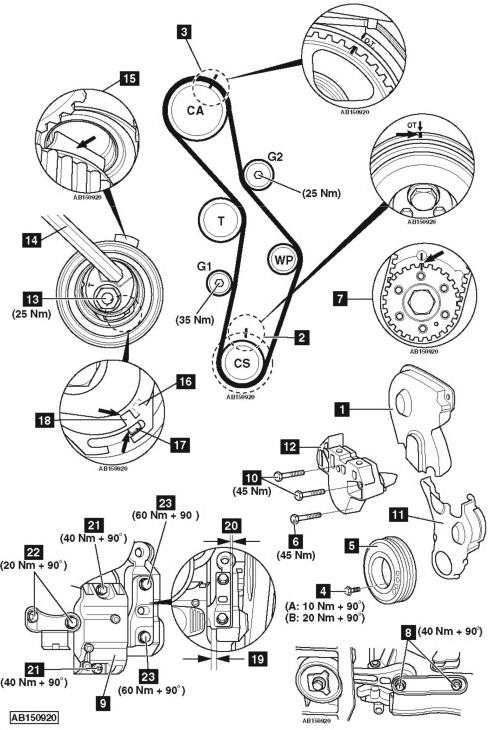 Volkswagen Passat 2.0 FSI turbo 2007 cambelt change instructions and replacement inteval. Full guide! Auxiliary drive belt tensioner locking pin – Volkswagen No.T10060A. Engine top cover (if necessary). Air filter and housing (if necessary). Partially drain coolant (if necessary). Remove fuel pump fuse from fascia fuse box. NOTE: If fuse is left in position fuel pump will be activated by driver’s door switch. Move evaporative emission (EVAP) canister to one side (if necessary). Coolant expansion tank multi-plug (if necessary). Intercooler to turbocharger hose (if necessary). Timing belt lower cover bolts. RH engine mounting bracket bolt  . Mark crankshaft sprocket and backplate with paint  . Remove engine steady bar bolts  . Turn tensioner away from belt. Use Allen key  . Lightly tighten nut  . Ensure crankshaft sprocket timing mark aligned  . NOTE: If reusing old belt, observe direction of rotation marks on belt. Ensure tensioner retaining lug located in slot in cylinder head  . Turn tensioner clockwise until notch  is above lug  in baseplate. Use Allen key  . Turn tensioner slowly clockwise until notch aligned with lug in baseplate  &  . Use Allen key  . Ensure notch  aligned with lug  in baseplate. Tighten RH engine mounting bracket bolt  . Tightening torque: 45 Nm. NOTE: RH engine mounting bracket bolt  is 25 mm shorter than the other bolts  . Crankshaft pulley bolts  . Use new bolts. Except AXX/BPY/BWA – A: 10 Nm + 90°. AXX/BPY/BWA – B: 20 Nm + 90°. Engine mounting clearance: 10 mm minimum  . Tighten engine steady bar bolts  . Tightening torque: 40 Nm + 90°. Use new bolts.